Dr Stephen Murphy, a Fellow at the ACM will give a lecture next week at the Asian Civilisations Museum in Singapore on Buddhism in Isaan. 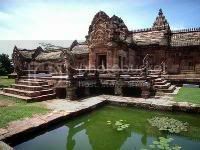 13 September 2007 (Bangkok Post) – Bangkok Post carries an interview with Thai archaeologist and anthropologist Srisakra Vallibhotama. I’m no expert in Thai history and archaeology, so I find it interesting of the article’s mention about how he’s challenging the notion of Thai history starting with the Dvaravati kingdom (instead of Sukhothai), and more interestingly his rejection of the theory that Sukohthai was colonised by the Khmers. Of both issues I am unfamiliar with, although I suspect that politics and nationalism is involved somewhere. Would any informed reader like to shed light on the situation? Nearly a decade after his retirement, scholar Srisakra Vallibhotama is still a man of action with a spirit of defiance who considers himself a “master of time”. At 69, Thailand’s leading anthropologist and archaeologist is still as busy as ever travelling, exploring, writing, editing, teaching – and questioning racist nationalism – to empower people across the country by reconnecting them with their cultural roots.